How do you exude authenticity, while at the same time selling $2.5 billion worth of product a year? This is the question Anheuser-Busch InBev is hoping to answer this spring with the rebrand of Budweiser and Bud Light. Let’s take an in depth look into the rebranding of an American icon. Millennials are the most skeptical generation in history when it comes to advertising, with at least one reputable survey in 2015 reporting that only 1% admit to placing their trust in messages from an advertisement. This distrust in an increasingly advertising saturated world leads to authenticity being a driving factor for millennials. The same report found that 33% of the demographic gets a majority of their information from trusted social sources, and a further 43% directly identify authenticity as key to trust. Craft beers embody this authenticity, unfortunately Budweiser and Bud Light are on the wrong side of this consumer need. “There is a growing demand for authenticity…and today’s mass brands [look] very ‘overproduced.’ .”— says Geoff Cook, a partner at Base Design, the firm responsible for the 2014 Miller Lite throwback branding which resulted in an 18% sales bump for the brewer. 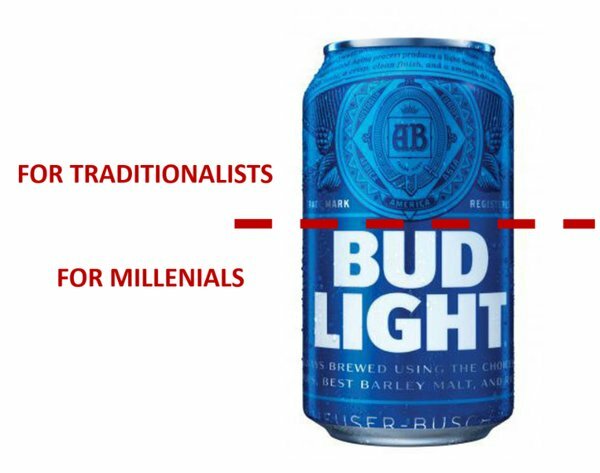 Budweiser and Bud Light would have a very hard time billing themselves as small, batch crafted brew, so they’re taking a different route to authenticity, they’re focusing on tradition. 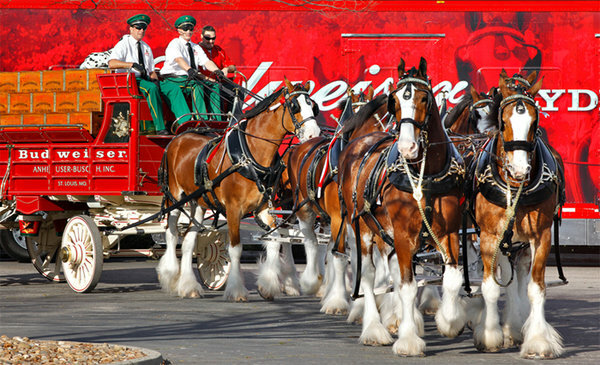 While they may not be able say that they are micro brews, it’s much harder to deny that Budweiser, and by extension Bud Light certainly have a long, storied history of beer making. For 2016, they are choosing to leverage this history with their new brand strategy to push themselves as an authentic beer choice. The Blake Project with Hotspex recently conducted our own internal study to understand the influence brand assets in the beer category have on consumers. We found that only an average 38% of respondents could correctly identify a leading beer brand’s typeface when prompted, with the most recognizable typefaces only registering in the low 50% range. In addition to rebranding Bud Light and all of its related brand assets, Anheuser-Busch InBev is also in the midst of a revamp of ‘The King of Beers’. The new branding sees Bud Light dropping the red accent in its swoosh device, this allows Budweiser to fully own the color red on its packaging. 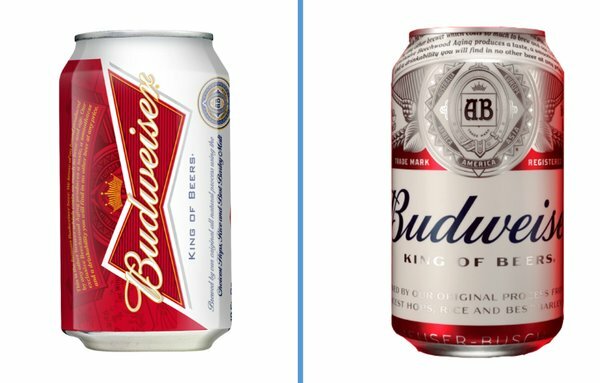 With the return to dark blue hand written font, which the creative agency responsible for the rebrand JKR has named ‘Bud Crafted,’ Budweiser has harkened back to its old brand colors but retained the handwritten logotype from its most recent packaging iterations. The most striking change is the removal of the iconic ‘bowtie’ graphic asset, which lives on in advertising and off package graphics. This focus on tradition has two key benefits. As mentioned earlier, a rebrand focused on the traditional intrinsically links the product with a feeling of authenticity. While both beers are shifting focusing to future generations of beer drinkers they can’t ignore the factors that have made them some of America’s best selling beers. It is those same factors however, that have led to a purchasing demographic that skews above 40. This balancing act between traditional consumer base and new customer acquisition could have been a disaster, but the new assets do a good job of taking both demographics into consideration. It is key to understand your brand identity and which of your brand assets are most distinctive and relevant to consumers. In this way you can know which assets are sacred and must be left as is, while identifying brand elements that are not adding value or worse, holding back your brand. Once you have identified which assets are troublesome you can evolve or remove them to free up real estate for the assets that are working hard for your brand. If your market is shifting/has shifted and you think its time for your brand to shift with it, we would love to help you uncover actionable insights on that journey. Simply email, Derrick Daye for more about how we can help you win in this changing world.